Designing experiential learning programs for adults has been “my thing” for over 25 years. 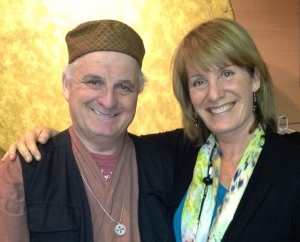 I’ve been gratified to set the stage for life-changing shifts for thousands of participants in academic, corporate, personal growth, and drumming groups. My life before drumming was in the business world, where I learned a lot, but which ultimately led me to a soul-crushing dead end. Luckily, I discovered drum circles. I was astounded at the depth of experience, learning, and transformative potential of group drumming. I’ve been enthralled and immersed ever since. I am part of the world-wide community of drum circle facilitators (DCFs) whose “hub” was created by the work of Arthur Hull. 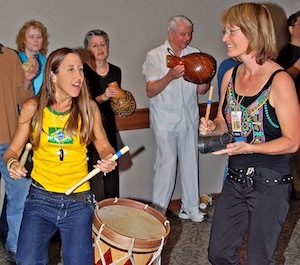 Arthur’s teachings, travels, dedicated rhythm evangelism, and focus on community building has built a powerful network of “rhythm practitioners” serving groups of all kinds. I have been fortunate to meet, visit, and work with hundreds of practicing DCFs at various trainings, conferences, and on my “Drumabout” travels. Long fascinated by how people come to this work from such wildly different fields, I’ve tracked “what works” as colleagues develop their DCF businesses and careers. Over the years, I helped produce programs for Drum Circle Facilitators Guild conferences, Arthur Hull / Village Music Circles, and the Seattle World Rhythm Festival. I developed programs and business strategy with Ju Linares of RitmoExpansão in São Paulo, Brazil. I have woven together influences from 3 worlds I’ve been immersed in as an adult. From Business & Operations, I learned how to lead and inspire people to help “Make it easy to do it right.” Groups who work together towards elegant efficiency and satisfying work flow can achieve amazing things! From Human Systems & Group Development, I learned multiple ways to look at the complexities and interrelationships of people, processes, and results. I found subtle, yet key factors and leverage points to influence group capacity that are rarely recognized. From Group Hand Drumming, I learned to relax my analytical mind and see a more complete picture. Through making spontaneous music with others, I discovered new ways to look at business and relationship issues — often with quicker, easier paths to resolution! I am proud to have studied with these teachers, and to call them my colleagues. I heartily recommend their facilitation work and training courses! Arthur Hull, Christine Stevens, Jim Boneau, Jana Broder, Cameron Tummel, Jú Linares. I like to say that “Collaboration is our DCF Superpower.” It’s at the heart of the drum circle form, and I’m proud that it is central to how we grow, share, and spread this work through our professional networks and friendships.